201 pages, 8.5" x 11"
The Pittsburgh Pirates have a long history, peppered with moments significant both to Pirates fans and Major League Baseball. While the Pirates are recognized as fielding the first all-black lineup in 1971, the 66 games in this book also include one of the first matchups in the majors to involve two non-white opening hurlers (Native American and Cuban) in June 1921. We relive no-hitters, World Series-winning homers, and encounter the story of the last tripleheader ever played in major-league baseball. Famous Pirates like Honus Wagner and Roberto Clemente — and infamous ones like Dock Ellis — make their appearances on the field, as well as recent stars like Andrew McCutchen. Some of the games are wins; some are losses. All of these essays provide readers with a sense of the totality of the Pirates’ experiences: the joy, the heartbreak, and other aspects of baseball (and life) in between. The book includes photos from the Pirates team archives. This book is the work of 37 members of the Society for American Baseball Research (SABR), including: Jeff Barto, John Bauer, Robert E. Bionaz, Thomas J. Brown Jr., Frederick "Rick" Bush, Alan Cohen, Paul E. Doutrich, Doug Feldmann, Jeff Findley, T.S. Flynn, Gordon J. Gattie, Tom Hawthorn, Rock Hoffman, Paul Hofmann, Mike Huber, Jorge Iber, Frank Ittner, Matt Keelean, Russ Lake, Bob LeMoine, Len Levin, Mark Miller, Seth Moland-Kovash, Bill Nowlin, Richard "Pete" Peterson, Stephen Peterson, Richard J. Puerzer, Eliza Richardson, C. Paul Rogers III, Harry Schoger, Blake Sherry, Wayne Strumpfer, Joseph Wancho, Bob Webster, Steven C. Weiner, Gregory H. Wolf, and Jack Zerby. E-book: Click here to download the e-book version of Moments of Joy and Heartbreak for FREE from the SABR Store. Available in PDF, Kindle/MOBI and EPUB formats. 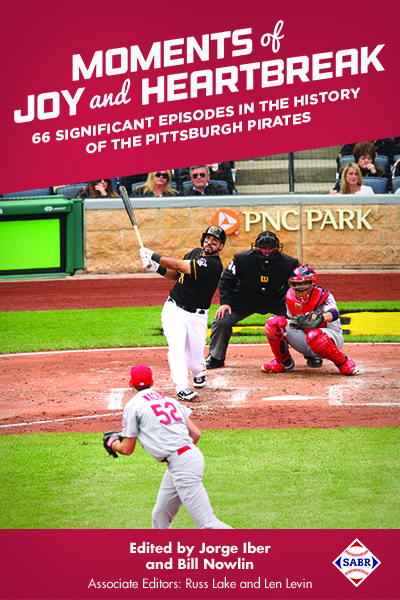 E-book: Click here to download the e-book version of Moments of Joy and Heartbreak for $9.99 from the SABR Store. Available in PDF, Kindle/MOBI and EPUB formats. This page was last updated March 23, 2018 at 2:20 pm MST.